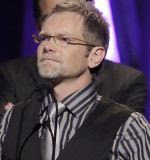 Steven Curtis Chapman was named Artist of the Year at the Gospel Music Association Dove Awards in Nashville last night, and in my opinion, there's no one more deserving. It's been a tragic year for Chapman and his family, with the loss of their 5-year-old daughter Maria last May. Steven and Mary Beth have shone as examples of grace in the midst of tragedy. They never minimized their loss or failed to acknowledge their pain and bewilderment. But they clung, visibly and openly, to the hope that Steven mentions in that quote above. and what a reunion it will be in our real home - heaven!